A recent Shark Tank episode aired which featured one of our very own Spartan Alumni, Joe Johnson. Johnson started his own company called VADE Nutrition after seeing a need and taking action. Johnson graduated from the Broad College of Business with a Finance degree. He served as President of the Student Athlete Advisor Committee and as Captain of the wrestling team. During Johnson’s time wrestling, he was known for having tubs of protein laying everywhere and powder covering the inside of his car. This mess inspired a new idea: dissolvable protein scoops. He and his wife Megan created a pre-measured serving of protein powder wrapped in a dissolvable film. The consumer can simply drop a pack in the water, shake, and enjoy. Their goal was to make this everyday process easy and mess free for everyone, and they did just that. This idea quickly became their passion and they decided to turn it into a business. With their determination and drive, Megan and Joe took their idea to the tank. When Megan and Joe first applied to Shark Tank they were denied the opportunity to get on the show. They weren’t ready to give up so they decided to apply again, and were accepted. They were both nervous and excited to show the sharks their idea. Johnson recalled feeling like he was back on the wrestling mat getting ready for the biggest match of his career. Johnson stated, “I think that's something that college athletics really prepared me for, to step up when the moment comes up.” They said a prayer, went out there, and gave it their all. Their prayer was answered; The Sharks loved the product. They received a deal with Mark Cuban and Alex Rodriguez and Megan and Joe launched into production. 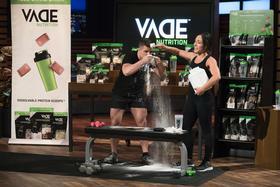 Johnson sees a bright future for VADE nutrition. He has hopes of bringing the product’s technology to other brands and would love to see VADE nutrition sold across the country. The MSU Alumni Association is proud to have such ambitious and hardworking alumni like Joe Johnson. If you would like to check out Joe’s product, visit www.vade-nutrition.com.